In every situation, every game or event, you’re bound to have winners and losers – and business is no exception. In fact, 9 out of 10 startup Entrepreneurs will fail to gain traction, forcing them to shut the doors to their business. But if you want to make sure you’re part of the few who do survive and thrive, then you do not want to miss this episode. Make Sure You Get The Memos! 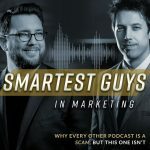 The smartest guys in marketing is the best show on the planet for client businesses to learn about traffic, funnels, sales, conversions, and marketing coolness. Chris and Taylor are the founders of Traffic and Funnels, a digital marketing consultancy helping you get paid clients from cold traffic, daily.